Gold pan colors and how the contrast of Gold in your pan helps you Find Gold. 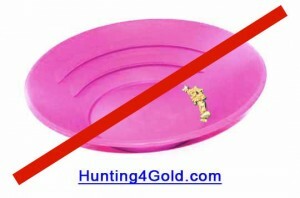 Gold prospecting is about finding gold, remember… Pink gold pans? Back by popular demand is our Pink Pan Video explanation about Gold pan colors and how the contrast of Gold in your pan helps you Find Gold. The Question: Why not Use a Pink Gold Pan? You will be surprised how color can affect you ability to see gold in you pan. Take a look at this gold panning video. how do you know the best place to dig? Please let me know what you think of each video. Of course ask me: What is your most pressing gold prospecting question? Do you think it’s better to by a claim or do the work of staking your own. pros and cons. Good question, I’ll be covering claims & strategies for gold claims a little later. For now it is best to sample with the permission of a state BLM authority (records show the claim is open) At that time it will be worth it to go through the effort & cost to buy the claim that looks best to you.